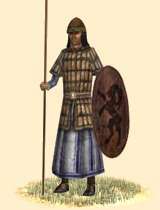 Lo'hamim Azzilim are armored in quality padded armour, tough leather shields and armed with spears. These men can be relied on to hold their own against all but the best heavy infantry. This tough, well armored infantry is the cream of Southern Arabian nobility and despite the land’s reputation for the production of aromatics these are not perfume wearing effeminates who can be easily brushed aside. Armored in quality padded armour, tough leather shields and armed with good spears these men can be relied on to hold their own against all but the best heavy infantry.